Are you ready for some football? Mote Aquarium’s resident manatees Hugh and Buffett are! 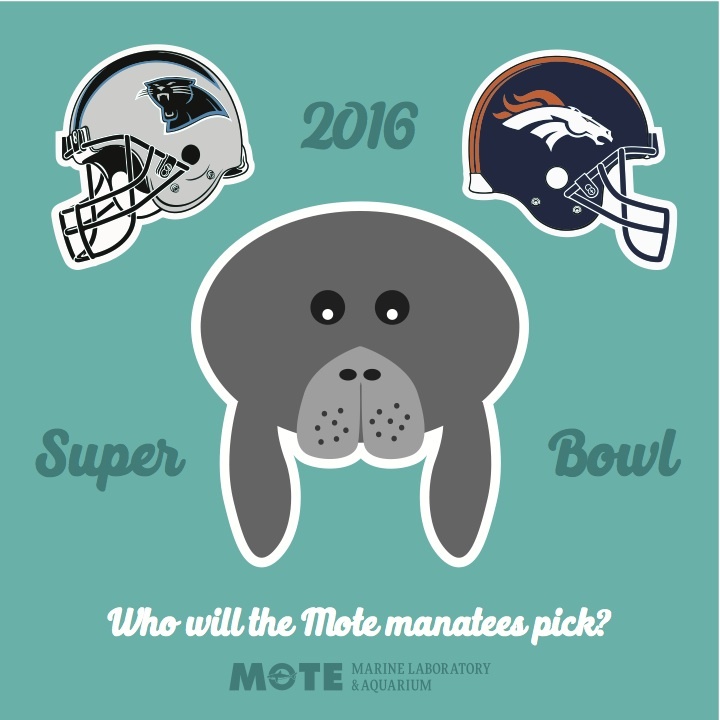 Come cheer on Mote’s manatees at 10:30 a.m. Thursday, Feb. 4 as they predict the winner of the Super Bowl for the ninth year in a row. Who will they choose for the winner of Super Bowl 50? Will it be the Denver Broncos or the Carolina Panthers? 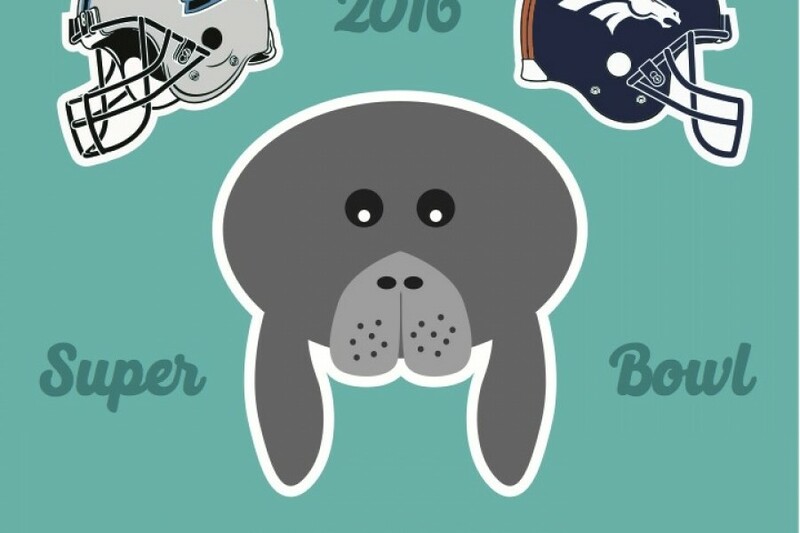 Whether you’re a Broncos fan, Panthers fan, or just a manatee fan, this is something you don’t want to miss. Hugh and Buffett serve as ambassadors for wild manatees and teach thousands of visitors each year how to protect endangered manatees in the wild. They are highly trained in behaviors that support their care. At 10:30 a.m. Thursday, Feb. 4, Hugh and Buffett will make their annual Super Bowl predictions. Buffett has accurately predicted the winner of the Super Bowl seven of eight times and Hugh has been right five of eight times. Who will be right this year? The Super Bowl has become a national event since its debut in 1967. Since that time football fans from across the globe eagerly await Super Bowl Sunday each year to see the season's best NFL teams go head-to-head. Super Bowl 50 will take place at 6:30 p.m. EST Sunday, Feb. 7 as the Denver Broncos and Carolina Panthers compete for victory. 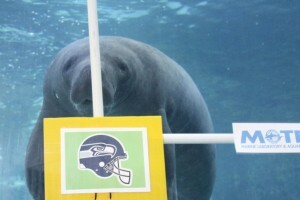 Aside from being sports fans, Hugh and Buffett are the world’s most extensively trained manatees. Training helps their veterinary care run more smoothly and allows the two manatees to participate in innovative research about how they use their senses, such as hearing and touch to survive, and about their physiology. Mote’s research is designed to help resource managers protect these endangered mammals. Moving forward, the researchers are studying manatee physiology. The primary goal of this study is to determine oxygen consumption and metabolic rates of manatees. To accomplish this, researchers will measure cardiovascular, metabolic and heat production of trained manatees during sedentary and active periods. The collected data may enhance physiological assessments of rehabilitating manatees prior to release.